"Elvis in Tinseltown" by Pat Long is absolutely brilliant. "The second coming" by Simon Goddard is also great and so is "The death of Elvis," where Mike Pattenden scrutinizes Elvis' tragic demise. Heartbreaking. Also, I totally agree with Pattenden's bio of Colonel Parker. Goddard on the hot leather suit that Elvis wore in the boxing ring: "On the inside Elvis was basking in his own leathery Turkish bath." Stephen Dalton on FROM ELVIS IN MEMPHIS: "Probably the greatest white soul record ever made." 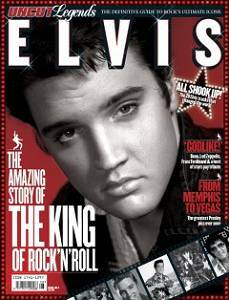 This must be one of the most ambitious Elvis mags ever printed! Go get it! Page 11: "Milkcow" written by James Arnold? Page 12: "Don't Be Cruel went to the top of the Billboard pop, country and black music charts in 1956. R & B = black music? Page 13: ARE YOU LONESOME TONIGHT: "The track took Elvis just one full take to get down..." No, it didn’t. Page 15: A photo from late 1972, where Elvis is promoting ALOHA (he is standing in front of a billboard with straw hats that have country names printed on top of 'em), is said to be from "Vegas Hilton's [sic] Elvis Summer festival, 1970." Page 20, photo text: "Elvis at the 1957 M-A State Fair and Dairy Show." Nope, the year before. Page 31: Lyric quote from "That's All Right" is incorrect. Memphis teenagers greeted each other with a line from that song? Page 35: Roy Carr on THE SUN COLLECTION, first issued in 1975: "Twenty years after its release, I'm still waiting." Page 56: "The TCB Band played almost 1,000 shows together." They did over a thousand shows with Elvis. Page 56: "Elvis turned to Burton during "Guitar Man" and instructed him to "play it, James"..." Elvis never played GM with James Burton. Page 57, photo text: Bill Black is mistaken for Gordon Stoker! Page 60, June 1958: "Elvis performs his last recording session until 1960." Page 66: Says here that Elvis recorded a song called "I Need Your Love" in Nashville 1958. I think I'll listen to it Tonight. Page 70, "interview" with Elvis in 1959 from Melody Maker: Elvis states that he lives on Audubon Drive, although we all know he purchased Graceland in 1957. Page 79, October 1964: Text has disappeared! Page 80, December 1966: "If Everyday Was Like X-Mas reaches #2 on the charts" - What??? HOW GREAT THOU ART beat SGT PEPPER to the Grammy for best engineered album? Page 103, at the time of the planning of The Comeback Special: Simon Goddard says that Elvis' last US #1 was "She's Not You"... Since Goddard raves about the "boxing ring" performance, I can't understand why he doesn't mention Alan Fortas. Page 104: Leiber & Stoller, not Lieber. Page 118: The March 1975 session in Hollywood: "No notable tracks beyond a cover of Green Green Grass Of Home." My God! What about "T-R-O-U-B-L-E"? Page 118, March 1975: "The live album of Elvis' 1974 Memphis show wins him his third Grammy." The album did not win a Grammy! Seems like the end of Stuart Bailie's article (page 123) has been edited? Page 124: Photo on this page is said to be from 1977. It is not. It's from '75. Page 142: Lyric quote from "Yoga Is As Yoga Does" is incorrect. © Crister Berge, Sweden 2005.